Marchwood Power is committed to achieving the highest standards of health, safety and care for the natural environment in all areas of its operations. The company works closely with government agencies and environmental organisations to ensure compliance with all appropriate environmental and health and safety legislation. Modern facilities of this kind represent advanced generating technology as they offer high operating efficiencies and low emissions. We operate at approximately 59.5% fuel efficiency, compared to around 30-35% efficiency in the case of the power station which was formerly on the site. 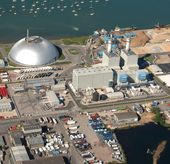 Following a comprehensive environmental impact assessment of the power plant, Marchwood Power received the necessary consents from national and local government agencies for the plant’s construction and operation phases. As part of the consents process, the environment authorities considered and approved detailed studies undertaken by Marchwood Power covering flora, fauna, landscape, traffic, noise and socio-economic effects of the project. Environmental impacts from the plant are controlled by planning consent from the local authority, and by the Environmental Permit and abstraction licence from the Environment Agency. Marchwood Power also participates in the Emissions Trading Scheme. A comprehensive environmental management system, covering a range of issues such as noise, emissions to air and water, waste management, sustainability, emergency planning and staff competence, has been put in place at the plant. The system manages our compliance with planning and environmental approvals, and has been externally accredited as meeting the requirements of ISO14001:2015 standard and OHSAS18001:2007 standard. It is constantly reviewed to ensure we continue to meet our environmental obligations into the future.